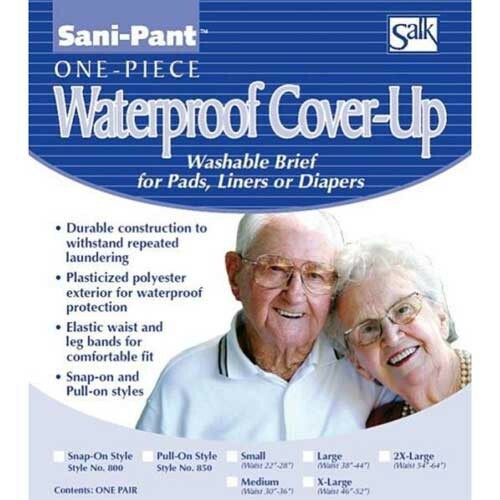 Sani Pant Reusable Briefs are waterproof briefs used for complete and assured incontinence protection. Each plastic diaper cover is constructed from soft, white, plastic-coated nylon, making them the ideal cover-up for pads and diapers. Sani Pant Reusable Briefs are machine washable and are made to be a long-lasting product for incontinence protection. Each plastic diaper cover can be simultaneously used with disposable or reusable pads and liners. If you're searching for a cost-effective way to combat extra leakage or spillage, look no further than these reusable and waterproof briefs. You might also be interested in similar incontinence protection products that we offer, such as Salk Helthdri Men's Heavy Absorbency Briefs. Waterproof briefs for incontinence protection. Made of soft, white, plastic-coated nylon. A perfect cover-up for pads and diapers. Accommodate disposable or reusable pads and liners. Why do they not on the plastic pants have them in a lot of different colors instead of just white I have to wear different color diapers why not plastic pants. Hello Richard, Currently the manufacturer is only carrying the white color. We are always looking into varying the products available colors. We'll be on the lookout for any changes. First set was less quality material. Works very well with disposables I wear daily. These Sani Pant waterproof pants have been an invaluable thing for me. I am 83 years (young) and my wife is 82, has dementia, and is extremely incontinent. I have her wearing adult diapers and Sani Pants all the time. They have saved many an item of clothes and our bed many times. They are so easy to clean. I would be lost without them. I would also be doing laundry every day if it weren't for these waterproof pants. Thank you so very much for making them. First plastic pants I ever wore. A buddy of mine suggested I try them, to help prevent leaks from the disposables I was wearing. I resisted at first, but he was right, they help a lot, and they hold up real good if you wash them right. The Sani Pant work well providing protection. They stand up well to many washings and are comfortable. Fits Great, feels Great, works Great! Great. Just as I expected. High quality. Great price!